I can't believe it has already been a month since our last Daring Bakers' challenge, and once again I had such a good time getting this one done. I got the greatest opportunity of all by making it in my kitchen with my mom beside me....It is quite special since we don't get to cook or bake together much often since I left France. Mom laughed when we were done putting it together because she felt she was not doing much. Since I move rather fast and I know where all my utensils are, I get around quicker but I really appreciated the help she provided by handing me the ingredients, weighing everything, washing the dishes and most of all being there with me in the same room, chatting about nothing and everything at once. I can't begin to tell you how much I loved the moments spent reminiscing about my grandmother or her teaching me how to make my first dough or chocolate mousse. 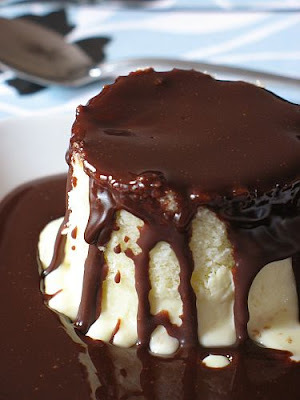 Mary, from my Alpineberry (one of my first blog reads) and our host for October chose a recipe that took a classic looking Boston Cream Pie and turned it into a completely 100% deliciously buttery and creamy: a Bostini Cream Pie. Eggs a plenty, heavy cream flowing like a river...everything to make your Tartelette a happy gal! Working with that many eggs, can be daunting for new cooks and bakers but remember to temper your egg yolks for the custard (adding some hot liquid to them so they get acclimated to the temperature rise) and folding in 2 or 3 times the egg whites for the sponge. Once to thin out the cake mixture thus making more susceptible to the texture change when you incorporate the rest of the whites. Eggs are fussy but when you get the basics, they really are just as sweet as the cake they make. 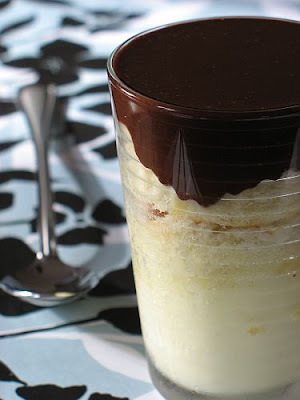 Or layer the custard, cake and glaze in glasses or cups. 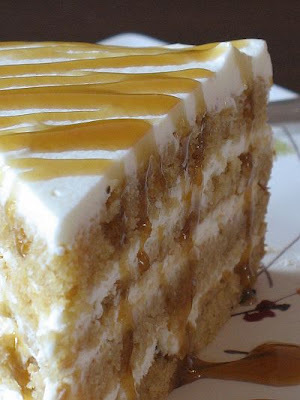 Waiter There Is Something In My...Butterscotch Mascarpone Cream Layer Cake! It seems like an eternity since I have participated in a WTSIM event, and that is not for lack of ideas, recipes or just plain desire to get in the kitchen and cook, but pure and simple lack of time. 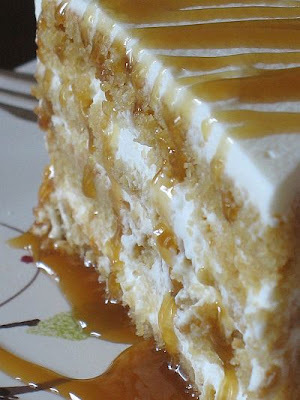 Oh sure, there are lots of baking going on in the house, but with all the visitors we have had lately I rely on tried and true, easy to come together desserts, most of which have already been published here...except this one Butterscotch Mascarpone Cream Cake.....And it has been a long time coming believe me! Let's see if I can make a long story short about that one (can I do that?! )...When I first visited Lisa last July, she had received a an issue from the magazine Wicked, a special publication from The Australian Women's Weekly dedicated to pastries and sweets. I remember looking at every recipe and drooling over them and the pictures. Her printer had a little malfunction that time, believe me it was all my fault, I just have to stare at anything plugged or battery operated for it to break down,....anyway, life took over and we both forgot about the pages I had marked in the magazine. This time around though, I went ahead and copied them by hand. I always do that, not that I don't trust the machine, but over the years I have developed my own recipe writing pattern, especially if I am at someone's house or the library and have minimal space to write them on. 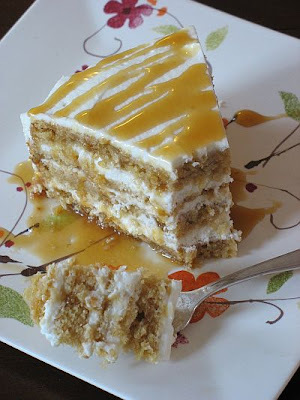 Back home this week, I quickly flipped my notebook to the Butterscotch Cake recipe..what's not to love in caramel, mascarpone and tender flaky cake? Nothing, trust me!! Cream together the butter and sugar. Beat in the eggs, one at time. Add the honey and flour. Add the milk slowly and mi until combined. Pour into 2 8-inch cake pans and bake at 350F for 45 minutes, or until a knife inserted in the middle comes out clean. Let cool and unmold. Cut each cake in half. Whip the heavy cream and sugar to soft peaks. Fold it into the mascarpone and spread 1/4 on one cake layer, repeat with all the cake layers, finishing with the cream on top. Heat the butter, sugar and milk until dissolved. Remove from the heat and add the powdered sugar, stir until smooth. Waking up this morning after getting in town late last night I really wished I had saved a couple of these beignets to pan fry and have along with my coffee....But no I was too greedy as they were made last week and eaten right before I went to spend the weekend at Lisa's house with Mary. My original intention was to post them for Sugar High Friday, hosted this month by Andrew. I believe I am a day late but I will send him my entry nonetheless and see if he accepts it. Back to the apple beignets...Ever since I was a child, I have been in love with them convincing myself that the frying oil effects were completely negated by the healthy aspect of the fruit..hummhumm. I went for a more grown up version this time, using the same method I had tried before (here) adapting it for apples. The fruit is first dipped in a light batter then coated with Panko breadcrumbs and then fried. You could deep fry the beignets but I did mine in a cast iron pan with about 2 inches of oil heated to 350F. The ice cream is once again nothing new, but a flavor I try to keep around as much as possible because we seem to go through it like crazy. The result exactly what I had hoped for, a childhood favorite adapted for my grown up palate as there is alcohol in the batter. Serve as soon as they come out of the frying pan, with a glass of cider and you're set! Preheat oven to 275F.Core the apples (do not peel) and cut them in half. Sprinkle with the sugar mix and bake for 30 minutes. Let cool. Combine flour, sugar, baking powder add water in a bowl until smooth. 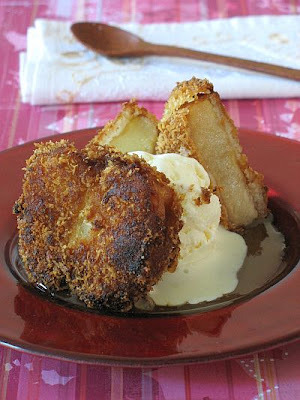 Dip apple halves in beignet batter. Roll in breadcrumbs. Deep fry until golden brown. Whisk the egg yolks with the sugar. In a saucepan set on medium heat, bring the milk and the cream to boiling point, slowly pour a small amount on the egg yolks to temper. Pour the remaining over the yolks and sugar. Stir well then pour back in the saucepan and cook over medium low heat until the cream thickens and coats the back of a wooden spoon. Remove from the heat and whisk in the cream cheese until completely melted and incorporated. Cool to room temperature. Cover and refrigerate until cold. Process in an ice cream maker according to your machine's manufacturer's instruction. Just like my baking partner in crime, Peabody (who is packing and moving right now), I am not posting as much as I would like to and let alone comment on other people's blogs but the past few months have been rich with life and full of good times and family moments that have kept me away and scrambling for time to come here and post. Not, that I haven't been baking! First there was my goddaughter Sophie during August, then a brief escapade to the beach and then my parents arrived. This Thursday I will be flying to my favorite home away from home and walking the markets and baking up a storm with another favorite lady of mine. That's right folks, Lisa and I are at it again, but this time we have Mary to add fuel to the fire! I "need" a little weekend away! When I come back next week, we have another friend staying with us for a week....so you can imagine than my posts will be sparse...but I promise a filled November...how's that? I could not leave for my little escapade without celebrating World Bread Day, hosted again by the wonderful and talented Zorra from Kochtopf. Last WBD was a huge success and the After Party was a blast also. I know this is last minute, but this will give you the general mood of things around here at Casa Tartelette for the past few months and the coming weeks....rush...rush...rush... Except that for this bread, ain't nothing but waiting, and being rewarded with the sweetest scent of yeasted apricot dough on a chilly morning (allright everything was there but the chilly part this morning). I know it's last minute to post about World Bread Day, but trust me we have been celebrating by nibbling on this all day long! 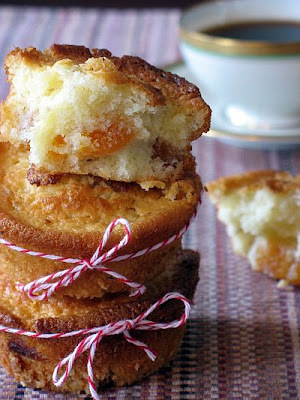 The recipe is from one of my favorite break baker, the super talented Paul Hollywood. I first caught a glimpse of his talent during an interview on the French food network years ago and I fell in love with his simple and down to earth demeanour. I started collecting some of his recipes and was delighted to find a library of his tv show on the UK food network. Some recipes also have videos to go along and it becomes quite entertaining to listen to him while you bake. I bookmarked his recipe for Apricot Couronne at least a couple of years ago and it took me all this time to finally make it. Boy! Did I miss on something good for a long time! This bread is easy to make, the dough is soft and stretchable at will and the scent as you cut into it and serve it with a hot cup of tea is just ...perfect. Makes me want to have a never ending supply of apricots and yeast to make this everyday! 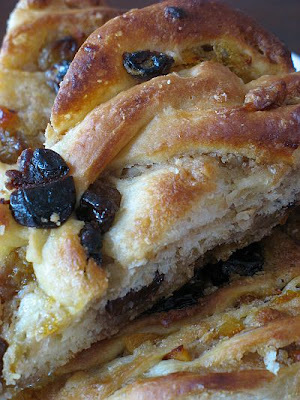 I made a a few change to it by substituting dried cherries for the raisins, adding orange marmelade inside with the filling instead of using it for a glaze. Don't be scared by the cutting through of the roll and twisting of the dough, there is really nothing to it if you just dive in (Look at the video and you will see what I am talking about). Apricot Couronne, adapted from Paul Hollywood. 1. Prepare the filling. Place the apricots and orange juice in a bowl and set aside to marinate for a couple of hours. 2. To make the dough, place the strong white flour, salt, butter, warm milk, yeast and egg in a mixing bowl. If using dried yeast, dissolve in the warm milk first, let stand 10 minutes, then add the rest of the ingredients. 3. Mix well together to form a dough. 4. Turn the dough onto a lightly floured surface and knead for 6 minutes. 5. Return the dough to a clean mixing bowl and set aside to rise in a warm place for 1 hour. 6. While the dough is rising, drain the marinated apricots. 7. In a mixing bowl, cream together the butter and brown sugar until fluffy. 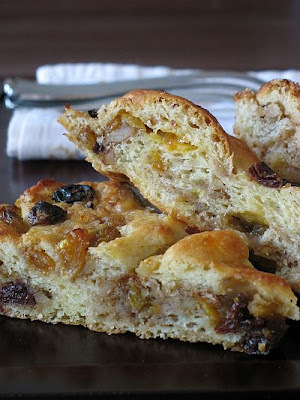 Mix in the drained apricots, flour, dried cherries, and walnuts. 8. Turn the risen dough out onto a lightly floured surface. Roll out the dough into a rectangle, approximately 25 x 33cm. 9. Spread the apricot mixture evenly over the dough rectangle. Spread the orange marmelade over it. 10. Roll up the rectangle tightly until it resembles a Swiss roll. Roll it slightly then cut lengthways along the dough and plait the 2 dough lengths together. 11. Place the dough plait on a lined baking sheet and set aside to rise for 1 hour. 13. Bake for 25 minutes until risen and golden. Set it aside to cool. Today, it actually felt like Fall for the first time. There was a little chill in the air this morning as we left for work, and we actually had to wear a little cardigan this evening while watching the sunset. The kind of weather that makes me very, very happy... I have been impatiently awaiting a good reason to make fall favorites such as pumpkins, cranberries, pomegranates and so forth. 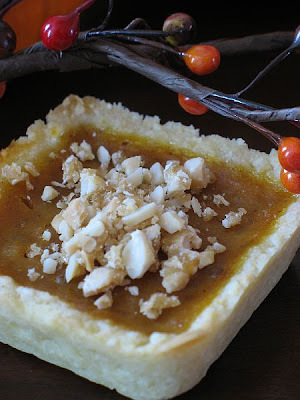 It is rather unusual to pop by the neighbors' house on a hot humid day with pumpkin praline pies and have they exclaimed "yeah, we had been craving those!". I tend to bring more fruit filled desserts or frozen ones. 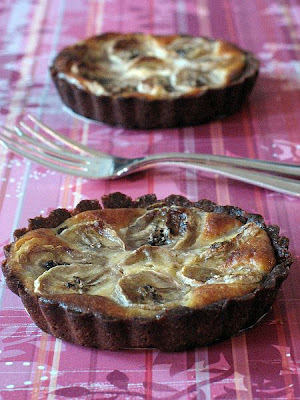 However, when I walked up the stairs to the twins' house with a small box of these tartelettes, I knew everybody had fall on their mind and a little place for them. C. opened the box while we were chatting on the steps and before we knew it there was cofffe brewing and the other neighbors chatting things up with us while the kids were already devising their Halloween parade....oh yeah, this year it is a parade!! 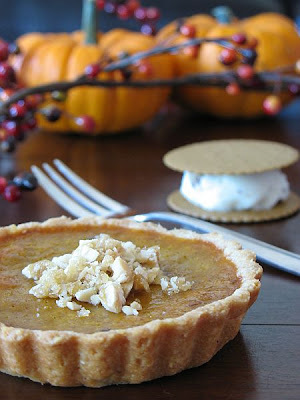 I know you have had or/and made countless amounts of pumpkin pies before so why would I was poetic about these? Well, there are the first I make this season and that is something so be tlaked about after month of scorching ht summer days and temperature refusing to drop below 80 degrees at night. It just feels nice to say the words "pumpkin pie". The tartlets were further enhanced by homemade butter pecan ice cream showcasing the first pecans our tree gave us and the delightful Moravian cookies we brought back from Winston - Salem this past weekend. Thanks again Abby for all your suggestions: Sweet Potaotes and their sister restaurant, The Cotton Mill were both great destinations for dinners the Reynolda house and Old Salem were incredible and we threw in the battlefield in Greensboro for good measure! Back to the tartelettes....all my favorites in a couple of bites: an almond shorbread crust, rich pumpkin and praline filling and a little touch of ice cream because...well...just because homemade ice cream rocks! For the praline, I used this paste I was given by another pastry chef in town, a sales rep. dropped two of and she wanted me to give her my opinion. Being as busy as the next person, I like the convenience of already made pastry "aids" like nut pastes and fruit purees and this particular one did not disappoint. You can also make hazelnut praline (caramelized hazelnuts) and grind it fine and use as such in the following recipe, but you can find good and affordable pastes on the internet nowadays that will your time more efficient in the kitchen. The dough is my go-to nut and butter dough inspired by Dorie Greenspan. Feel free to change the nuts in it, walnuts work as good as (even better in my taste) almonds. It needs to be rolled between sheets of plastic wrap or parchment paper and kept as cold as possible, even when handling. Use your fingertips to pat and patch it if it tears. The filling is inspired by the same Richard Leach I love and admire so much, except that I do not have time this week to follow through with his beautifully designed plated desserts. It was my first try at butter pecan ice cream and it has now become a new favorite. If you don’t have an ice cream maker, you can freeze the custard for a couple of hours, beat it with an electric mixer and refreeze again, repeating the operation 2-3 times, until you get a proper ice cream consistency. Feel free to use your favorite cookies for the ice cream sandwiches (the Moravian cookies I used had a ginger flavor). In a food processor, combine 1 1/4 cups flour, 1/2 cup powdered sugar, 1/4 cup walnuts and 1 stick of butter, pulse until it resembles coarse meal, add 1 egg yolk and pulse until combined into a ball. Flatten the into a disk in between sheets of plastic wrap, refrigerate and roll it out to cut rounds big enough to fit into 8 mini tart pans. The dough gets soft very fast so you can flour your fingertips to push it up and down the sides and bottom of the pan. Bake at 300 for 10 minutes. Let cool before filling them. In a large bowl beat the eggs with the sugar until combines. Combine the pumpkin and praline paste and cinnamon and add to the egg mixture. Slowly whisk in the milk and the cream. Divide evenly among the tart shells and bake at 300 for 20 minutes or until the custard just starts to set. Let cool to room temperature. Preheat oven to 350°F. Toast pecans in a shallow baking pan in middle of oven for 7 to 8 minutes. Add butter and salt to hot pecans and toss until butter is melted, then cool pecans completely. Whisk together brown sugar, granulated sugar and cornstarch, then whisk in the eggs until combined. Bring milk and cream just to a boil in a heavy saucepan over medium heat, then add to egg mixture in a stream, whisking constantly, and transfer custard back to the saucepan. 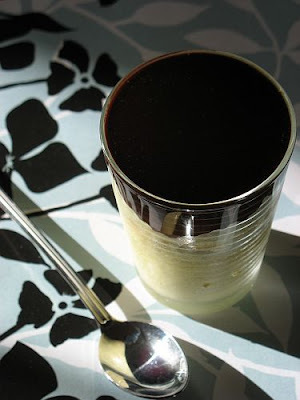 Cook custard over medium low heat heat, stirring constantly with a wooden spoon, until thick enough to coat back of spoon (do not let boil). Leaving for a weekend getaway is fun and relaxing, especially with my parents (the “in-laws” for B.) They are really fun to hang out with, always ready for the next thing whether it is an exhibition or a hike. I am really happy that they adore B. and we all get along watching rugby (go France) or playing cards. I am not saying it is always rosy but when the logistics of packing for a trip and unpacking when we are back are easier when everybody gets along. I had to work last evening so I left the house in the hands of mom…unpacking the goods and knickknacks bought along the way, separating the laundry, taking care of my poor husband suffering from a terrible lumbago, etc… When I got home there was a post it on the counter top next to a plate of overripe bananas, “we are at the dock, catching shrimp for dinner. These bananas need to be used. We want dessert!” Now, this is a command I am most happy to execute! Especially if they took the time to fish dinner and all I have to do is fix the salad…There is nothing that screams more vacation to me than having boiled shrimp and salad for dinner. You can make a mess right there on the table and get silly on cocktail sauce and beer. Back to the bananas…Right before my parents got in town, I had started to prepare a tart dough for one of my husband’s favorite pies but never got around to use it much less go beyond that part of the prep work. Hopefully I’ll get around it soon but in the meantime I had a whole delicious chocolate dough parked in the fridge about to give me a hissing fit if it did not get used (remember that my ingredients speak to me). 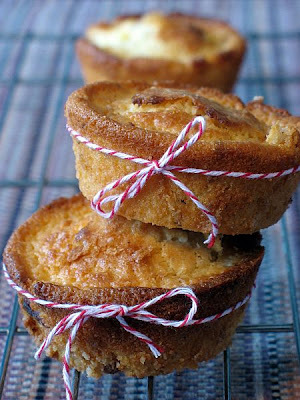 Not wanting to make a dozen little tarts (too easy to eat! ), I divided the dough in half and froze the rest for later use. Coming back home is always nice but the bananas had a most definite sad look about them. Not it was not cake or crumble, but tarts this time, how surprising eh?! The mascarpone filling is pretty straightforward. I used it a lot in catering and can't tell you where I got it from, we all seem to have passed it down to one another over the years at the restaurant. You can use cream cheese if you prefer, but I like the smooth texture and sharper taste of mascarpone, especially with a touch of almond extract. Perfect balance to chocolate and bananas, and perfect bite size dessert after a big crab and shrimp boil! Sift flour with cocoa powder and make a well in the center. Add the egg yolks, sugars and vanilla to the well. Combine with your hands or a mixer and add the butter pieces. Knead with your hands 2-3 minutes or until the dough comes together. Divide in 2 and wrap in plastic. Note that you only need one half for the recipe. Refrigerate at least 20 minutes prior to using. Let cool completely before feeling them with the mascarpone cream. In a large mixing bowl, combine the mascarpone, sugar and egg. Whisk until well blended. Add the lemon juice, zest and almond extract. Divide evenly among the tart shells. 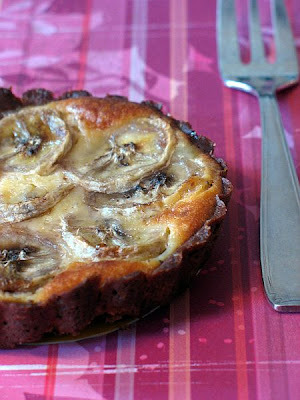 Arrange the bananas slices over, pushing them in the cream a little. Bake at 350 for 10-15 minutes or until golden brown. Ever since that little magic bean popped up on French blogs, I have been intrigued to try it. I had heard about it, seen it even smelled it but sourcing tonka beans here in the US was somewhat difficult, even five years ago, at least in my town (not that we are the culinary black hole of the universe). Nowadays, it is a little easier to locate but when my mother asked me what I wanted her to bring (along with the chocolate bars, silicone molds and other baking items I asked) I jumped at the chance to finally get a big bag of tonka bean at a relatively cheap price. 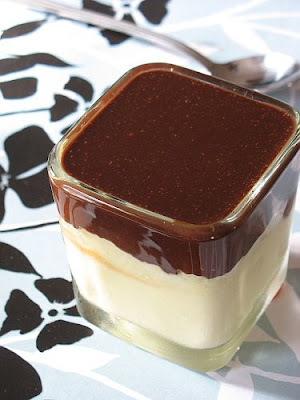 You can use to infuse liquids such as creams and milk for flans, creme brulees, sauces, etc...or you can directly grate it with a microplane (easier) and directly add it to your preparation. I kept the little knobs I could not get through the grater and put them in a jar of sugar for instant flavor. If you are really gunho about not having little specks of tonka bean, I guess you could process them fine in a coffee grinder but I like my tonka to show, much like the seeds of vanilla beans. That reminds me of a woman dining at the restaurant one night and sent her vanilla bean creme brulee back to the kitchen. I asked the waitress what was wrong with it and she replied rolling her eyes to the ceiling (at the customer) "She said there was dirt in it"....Argh!!! I guess she would not wait vanilla bean ice cream either, eh?! We have planned to drive to Winston-Salem, NC this weekend and spend some relaxing time visiting the town, with my parents, and thanks to a local, Abby of Confabulations In The Kitchen, I think we have a pretty good list of great places to see. 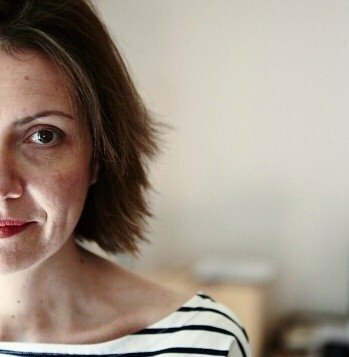 I wish I could meet her in person and give her a great big hug, because she has saved me hours with her guidelines and recommendations, especially local delicacies, restaurants and of course bakeries! I wanted to pack some home baked goodies for the drive and immediately thought about mini cakes with grated tonka beans. I remembered a post titled (translated from the French): "A cake to die for", where the tonka bean was paired with apricots and white chocolate....I am a not a chocolate snob and as long as it is good quality I will eat all kinds. I was once again spoiled by one of my clients when she brought me a few bars of Valrhona chocolate from a recent trip to France. Well, by now you must know my theory: if all the ingredients are getting together like that, that means I must join the party!! The cakes are quick and easy to come together and you can make a loaf cake or a round cake, possibilities are endless, and you can't barely taste the white chocolate if you are not a fan. I would not take it away from the recipe though as it adds a little fudge feeling to cake. However, the biggest problem is that by the time we get in the car tomorrow, en route to Winston-Salem, there won't be any left....it is absolutely the best mini cakes I have ever had! They are out of this world warm and a little denser and flavor concentrated at room temp. What the heck! They are even to dye for straight out of the fridge at 2 in the morning! OK, I hear you, you may not have tonka beans available where you are, but a good substitute is to combine 1/2 tsp. each good quality vanilla and pure almond essence. Whisk together the eggs and sugar until pale and thick, about 2-3 minutes. Add the butter and chocolate. Whisk well and add the flour. Finely grate the tonka bean and add to the batter. Add the dried apricots and mix until incorporated. Divide evenly between muffin tins coated with cooking spray and cook for 15 minutes (longer if using a larger pan, about 20-25 minutes). P.S: no internet connection for the next 4 days, so have a great weekend ya'll and see you back next week! "The coumarin active component (and why it is not found in food products in the US) is chemically similar to the active ingredient found in a common blood thinner called warfarin or Coumadin. This medication is commonly used to "thin out" blood and prevent clot formation. Patients on this medication have to have regular blood test since too much, may pose them at risk for bleeding and too little--risk for clot formation. The dose varies so regular blood work is the only thing that we can use to adjust the dose. You can imagine that there are a lot of drug interactions when patients are on this medication. There are also food interactions." So folks. just like everything in life (but love and chocolate) use in moderation! I wish I could tell you I am sitting right here enjoying one of these lemon lime cupcakes as I type my post but truth is I am trying to write in a room where English and French are mingling with hand gestures and strange sounds, and my brain is not sure this post is going to make sense by the time you read it. I tried isolation, taking one cupcake to the office room, sitting down at the computer with a cup of tea but I keep being interrupted because it seems that nobody understand my house, kitchen and pantry set-ups, hmmmm....really?....and I thought I was Ol' Deat Martha!! Anyways...back to the cupcakes. We have a saying in French that goes like this: "Il n'a pas invente la poudre" translating as "he surely did not event gunpowder", which is pretty much what I did when I made these the other day. They had been on my "must try" list for a long time and this month I finally had the opportunity to play around with them and my blow torch. I used a recipe from one of my favorite blogs, Cupcake Bakeshop. Cheryl's site is not only amazing to look at but I admire her adventurous spirit when it comes to pairing ingredients and flavors, creating recipes and styling them with the most relevant details. I fell in love with her meringue cupcakes ever since they jumped at me through the screen. I followed one of her recipes for the cupcakes adapting it to fit Laurie's challenge, except I can't remember which one as I scribbled it in my blue notepad one day I was in a hurry. I used lime oil as an added boost of flavor. 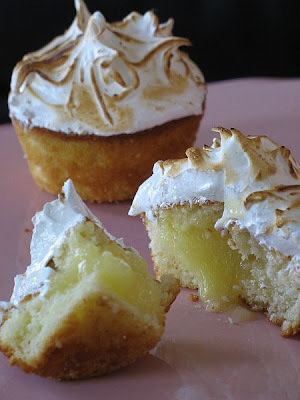 The lime curd inside is my usual foolproof recipe that I make time and time again and probably make you guys sick ad tired of it....but if it ain't broken why fix it? 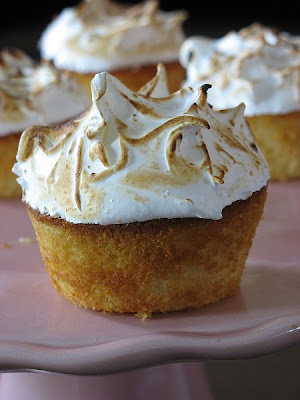 As for the meringue, well, if you have a blow torch it does make the job easier. I have not tried the broiler in my oven for these so far, but if you do, please let me know the outcome. In the bowl of an electric mixer with the paddle attachment, cream butter and sugar. Add eggs, one at a time, beating well in between each addition. In a medium bowl, combine the flour, baking powder, and salt. Add flour mixture and milk alternatively to the butter/eggs mixture, beginning and ending with flour mixture. Add the lime juice and zest. Fill cupcake tins 2/3 full. Bake at 350 for 20 minutes until a cake tester comes out clean. Combine the zest, sugar, juice in a saucepan, and bring to a simmer. In a small bowl, beat the eggs until light.Beat some of the lemon mixture into the eggs to temper. Scrape the mixture back into the saucepan and cook stirring constantly until it thickens up, about 5 minutes. Remove the curd from the heat, let cool completely. Combine egg whites and sugar into the mixing bowl of your stand mixer and set over a water bath. Whisk by hand for a few minutes until the sugar is dissolved or preferably until the mixture reaches 110F . Transfer bowl to electric mixer, beat on medium speed for 10 minutes. Add lime juice Beat on high speed until stiff glossy peaks form, about 2 to 5 minutes more. To fill the cupcakes: with a sharp knife cut a small hole in the cupcake, not cutting all the through. Fill the cavity with the lemon curd, and put the top back on. 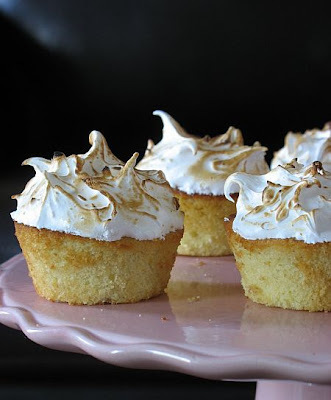 Spread the meringue and brown with a blow torch.